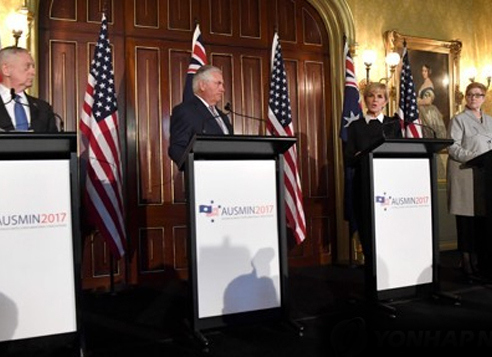 The United States and Australia held high-level security talks Monday and agreed to work together to "impose greater costs" on North Korea for its provocative behavior, officials said. The so-called "two plus two" talks in Sydney, which brought together the foreign and defense ministers of the two countries, came after a series of missile tests by the North that demonstrated steady progress in Pyongyang's nuclear missile development. "We discussed challenges on the Korean Peninsula, in particular the destructive behavior of North Korea in its nuclear and missile weapons testing, and what we can do together and with other nations to curb this behavior and the risk that it poses, not only regionally but globally," Australian Foreign Minister Julie Bishop said during a joint news conference. Australian Defense Minister Marise Payne said that the two sides reaffirmed their condemnation of the North's ongoing provocations, saying they pose a grave threat to both global and regional security. "We are committed to working very closely together with our regional partners, to impose greater costs on the regime for that destabilizing behavior," she said, according to a transcript provided by the Pentagon. US Secretary of State Rex Tillerson urged the North to give up its nuclear program.